Hello! I'm back! Sorry for the unplanned lack of posts recently, I've been very busy (but happy!). I am hoping to get back into the swing of my regular routine very soon. To start off, today I have two nail art looks using items for June's 'Wild Thing' MeeBox (you can find my unboxing and swatches here). 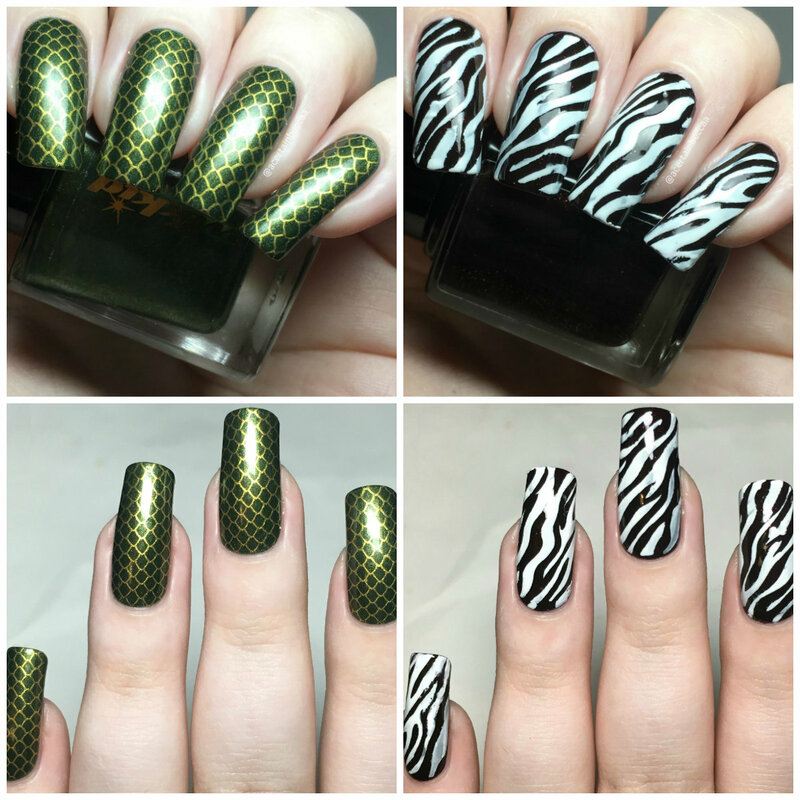 Read on to see both manis in full and for more info! 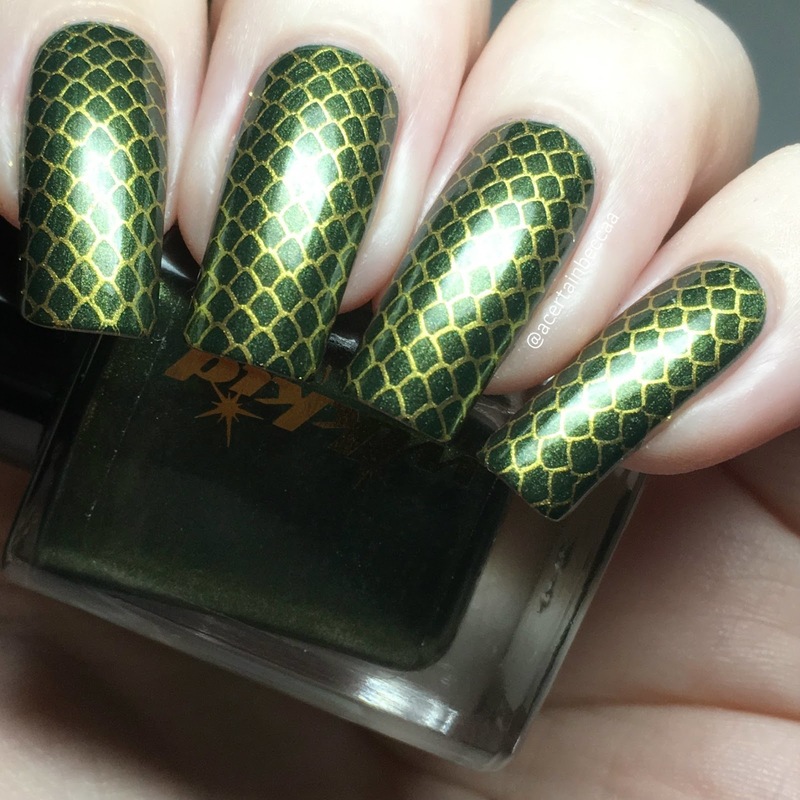 First up, I stamped a snakeskin/scale pattern over Wikkid Polish 'Forest'. As soon as I saw this polish in my MeeBox, I knew this had to be done. I stamped using a Born Pretty Store gold stamping polish and UberChic Beauty plate Fairytale-01. Next, I used the nail vinyls we recieved from Caution Vinyls. I paired them with a base of Prism Polish 'Drogon'. I applied a vinyl to each of my nails, painted over them with white polish, then carefully peeled them off. I finished by sealing my stripes in with Glisten & Glow topcoat. What do you think? 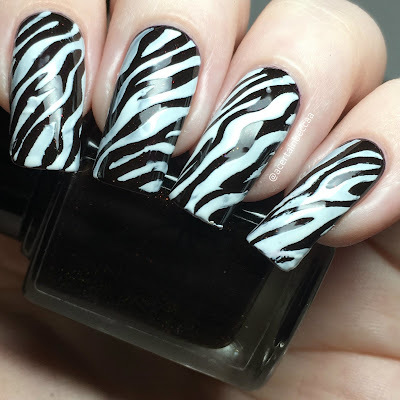 I love both of these manis, but especially the zebra stripes as I do have a thing for zebras! Like I said earlier, I have been very busy recently so haven't been posting as often. However July's MeeBox arrived in the post this morning - I will get it swatched and share it as soon as I can! hmmm, they both cool designs, if I were to imagine having wearing them, I would choose the snake skin pattern.